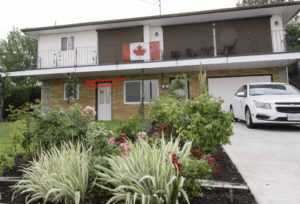 The Rose Garden Suite B&B is a self-contained one bedroom suite located in mature, quiet and friendly neighborhood. Available with continental breakfast. Ground floor, bright, clean suite with full kitchen, sitting area, 3 1/2 bath, and laundry. 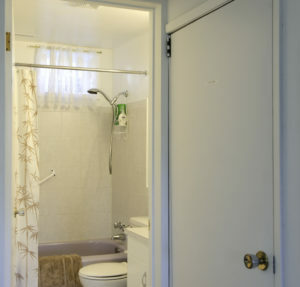 530 square feet of privacy! Keyed, entrance with security light. No stairs. A few blocks from downtown, restaurants and shops. 5 minute walk to the beach. 5 minute drive to U.S border. Softened hot water, whole home filtered water, central air-conditioning. Owners live upstairs. Kitchen includes full size stove, full size fridge, microwave, toaster, coffee maker, kettle, dishes, pots & pans. Gas Barbecue available. All linens, TV monitor (Netflix), Wifi 150, radio, CD and DVD player included. For those of us with allergies, we are feather free, smoking free and pet free. Stunning mountain views and a backyard pergola and vineyard. 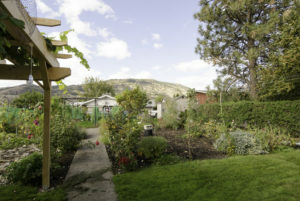 We are close to many award winning wineries in the South Okanagan Valley (wine tasting and tours available in season). Golf, hiking, biking, Summer festivals, art shows, galleries, museums etc. are all nearby. For the cooler months many winter sports are available. Adult oriented, unsuitable for children. Seasonal pricing – email us for details and availability! For Snowbirds: monthly rate of $800 (utilities included), 50% deposit required. No-noes: no smoking of any kind, no illegal drugs, no pets, no parties, no events, no shoes inside please. To avoid a $75 cleaning fee, please leave our suite as clean as you found it, including washing dishes. For short term visits, please leave all used linens in the laundry hamper provided. Washer & dryer provided for use by longer term visitors.